Get out your binoculars! These raptors can only be found in Iowa during the winter as they breed elsewhere. It may not officially be winter but it sure is acting like so maybe you'll get lucky and catch a glimpse of these winter residents. Most common in the bluff country of Northeastern Iowa, golden eagles can be found from November through March. 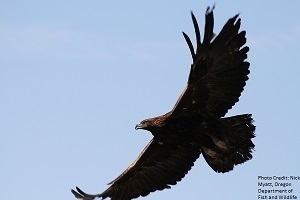 Golden eagles are known to defend their young or prey from coyotes or bears. Although capable of killing large prey like cranes and wild ungulates, it normally subsists primarily on rabbits, hares, ground squirrels, and prairie dogs. Golden eagles are brown with a variable yellow to tawny brown wash over the back of the head and neck. Adults have a faintly banded tail and their wingspan is 80”-88”. Immature bald eagles are frequently misidentified as golden eagles. It takes 4 years for adult plumage to be acquired. A small hawk, with the males, which are smaller than the females, being the smallest hawks in North America. The wingspan is only 16”-23”. 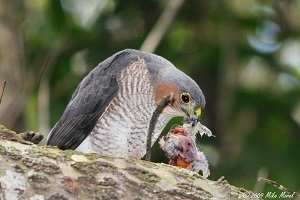 They generally look very similar to the Cooper’s hawk though they are smaller. The male Cooper’s hawk and the female sharp-shinned hawk can be particularly hard to distinguish because they are about the same size. The adults have blue-grey above and pale reddish below. Adult sharp-shinned hawks will continue to feed their young weeks after they fledge, initially dropping the food in the nest, but later forcing the fledglings to take it from them in the air once they have gained some skill. It overwinters in Iowa but heads north during the summer to nest in the arctic and subarctic regions. It is a large hawk with a wing span of 52”-55.” It is typically dark brown with a tail that is dark at the tip and pale at the base. 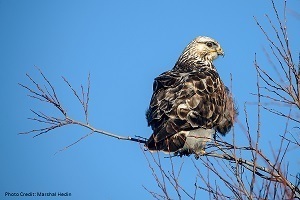 Like many Buteos, the rough-legged hawk has a dark and a light morph. The hawk gets its name from the feathering that extends down the legs to the base of the toes, which is useful for staying warm in cold weather. It hunts by hovering over a field and watching for movement below. 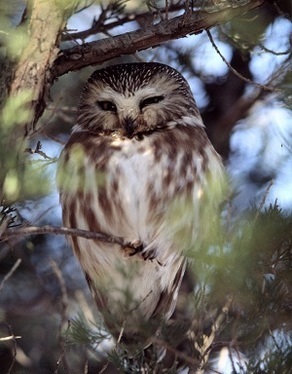 This small owl, often described as the cutest owl in North America, can be found during the winter days sitting still on the branches of conifers in Iowa woodlands. They have a special affinity with conifers and nest in the conifer dominated forests to Iowa's north. They migrate south in the winter, looking for abundant sources of their favorite prey, deer and white-footed mice. The migration of the Northern Saw-whet has been a subject of study and Project Owlnet collects data from owl banding stations across the U.S. to try and learn more about this species migration patterns. Please note that these aren't the only raptors found in Iowa during the winter months. Many of our nesting raptors do stick around during the winter months and you will still see plenty of Red-tailed Hawks, Cooper's Hawks and Bald Eagles flying and roosting around. PleaPlead to edit this placeholder text.